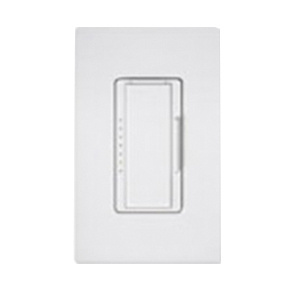 Lutron Maestro® Multi-location dimmer switch adjusts the dimness by multiple taps. To get delayed fade-to-off, press and hold and release the switch. The rocker helps to adjust the light level. It adjusts the light level and controls the brightness in the dark. This dimmer switch in black, is compatible with incandescent, halogen and magnetic low voltage halogen bulbs. The 600-VA, 450-Watt switch is perfect for lighting, indoor commercial and residential applications. Dimmer switch meets UL, cUL, NOM, CSA and ISO 9001 standards.